Here is another way to make spaghetti. I’ve said it before, but my cute husband doesn’t really like traditional spaghetti. However, he’ll eat this. I’m sure the addition of cream cheese helps, but hey . . . I’ll take it . . . and so should you. Think pasta, cream cheese, rich marinara sauce, and more cheese. Uh huh . . . dreamy, right? I’ve seen versions of this meal floating around blogs and Pinterest with raving reviews so I just had to give it a whirl. I trimmed the recipe up a bit and we absolutely adore this meal. It’s hard to not go back for seconds! My little baby gobbles it up right along with us. It’s made in a casserole dish, so it makes a great family-style meal. Since we are a small family we always have leftovers. And, well, since it’s summer I am completely in love with leftovers because we are so busy playing these days that sometimes we don’t want to take a break to make dinner (or maybe mom is simply too tired from all the play – let’s be honest!). If you want a delicious spin on traditional spaghetti, add this to your lineup. It’s so yummy (and easy, mind you!). Cook pasta according to directions on package, only to al dente. Meanwhile, heat a large skillet over medium heat. Add ground turkey, garlic salt, salt and pepper. Brown the ground turkey until cooked through. Stir in your spaghetti sauce. Drain and place cooked pasta back into your pan. Add in the cream cheese and Italian seasoning. Stir until cream cheese is melted (this is easier if your cream cheese is at room temperature, but it will still work if it isn’t). Lightly grease a 2-quart casserole dish (a 9×13 baking dish would work too). Spread a small amount of meat sauce in the bottom of the dish. Put spaghetti on top of sauce and top with remaining meat sauce. Sprinkle Parmesan cheese on top. Bake for 30 minutes on 350 or until bubbly. We love, love, LOVE this! 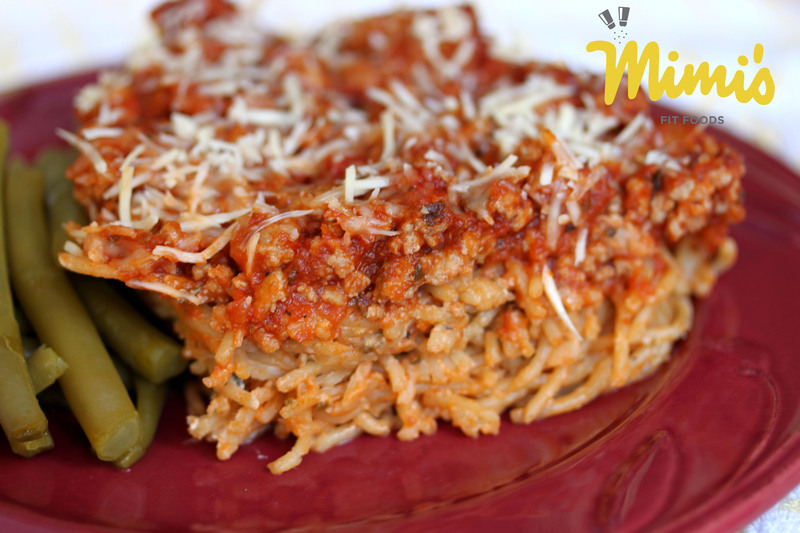 The first time I made it I knew it was a winner when hubby had three servings and declared it “the best pasta recipe ever.” The second time, I reserved some of the pasta water and added about 1/4 cup to the pasta when I added the cream cheese. It helped disperse the cream cheese and the end result was nice and moist while still retaining the creaminess. Thanks for the great recipe! Yay! So glad you love it! Thanks for your comment!